Fishing and hunting insurance in Spain, Hunting Insurance, fishing insurance and personal accident and injury insurance the protects you properly. Hunting & fishing on Spanish territory. www.insuranceinspain.com can provide you with a hunting insurance policy in Spain. This might seem a little bit unusual for most Expats but there is a large contingent of hunters that require insurance for their sport. We do understand that there is a need to protect the hunters and those around them from accidents and events that may and do occur whilst hunting. Mandatory third party liability insurance. The insurance policyholder is the sole insured party. Any person over 14 years of age who holds a hunting license and who meets the other requirements set out in the Hunting Act or the hunting legislation in the corresponding autonomous community. Hunting shall be understood as a sport performed by people using any means, weapons or any other suitable means to search, attract, follow and stalk the animals listed in the Hunting Act as game, with the aim of killing them, getting close to them or aiding their capture by third parties. By taking out this compulsory cover for all hunters using weapons to hunt, the insurer undertakes to indemnify the insured hunter while hunting, up to the quantitative limits currently in force, for events that cause bodily injuries. The regulations set forth for hunting in the autonomous communities with authority on such matters and, secondarily, those stipulated in Article 52 of the Hunting Act 1/1970 of 4 April; Articles 73 and 76 and, secondarily, those set forth in other applicable provisions of the Insurance Contract Act 50/1980 of 8 October and the revised text of the Regulation and Supervision of Private Insurance Act. That set forth in the legal provisions of the regulations regarding compulsory hunting liability insurance (Royal Decree 63/1994 of 21 January). The damage mentioned in the previous section caused by the involuntary firing of a weapon. Those caused by hunting under any of the following circumstances: Not having obtained the relevant license or when the license has expired, with prohibited weapons, in the closed season or under the influence of alcohol or toxic or narcotic drugs. Any damage or losses caused by the reckless use of hunting weapons in secure areas. Cases in which the person responsible for the damage fails to provide aid to the victim. This cover is valid exclusively in Spanish territory. The amount indicated in the policy schedule, which shall be the maximum limit per claim. Any cases in which the hunter does not have to pay any indemnity because the incident was solely through fault or negligence of the injured party, or due to force majeure. Any defects, breakages or failures in hunting weapons and the mechanisms or ammunition thereof shall not be construed as force majeure. The hunting regulations in Spain vary from and within each Autonomous region. Most of these Autonomous regions will have an Official website which specifies the documentation that needs to be submitted for a hunting license in Spain. For any form of hunting in Spain you must have a hunting license, issued by the Autonomous region you are planning to hunt in, a firearms license, issued by the Ministry of the interior via the Guardia Civil Firearms control, and the mandatory insurance which is also available from www.insuranceinspain.com. If you are a European Union citizen you will need your European Firearms card from your country of origin and that will have to be authorised by the firearms control of the Guardia Civil at your point of entry into Spain, or by the Firearms and Explosives Control where you are going to do the hunting. Other permits may be required and may be issued for several trips up to a maximum period of one year, renewable. The following is a link to the Official Website of the Guardia Civil, which will provide you with all the details necessary on bringing your firearms to Spain for hunting purposes. For more information we recommend visiting the Official Website of the Royal Spanish Hunting Federation. There are a large number of Hunting tour specialists in Spain that can offer you all of the necessary permits and licenses for the benefit of foreigners wanting to enjoy their hunting in Spain. It is somewhat easier to utilise the services of some of these hunting tours to enable a quick and easy entry into shooting and hunting in Spain. They will arrange all the documentation, supply all of the equipment and provide you with an experience that is free from the worry of gun and ammunition ownership in Spain. Please find some of these links below. www.insuranceinspain.com can provide you with this inexpensive third party liability cover for fishing, which can cover you from 150,000 to 3 Million Euros. The 3 million Euros policy for third party liability is less than 100€ and is well worth having. If you are planning to fish from a boat, we can also insure your boat to include these insurances as standard. Please call us on 965 27 57 27 for further details. We would all love to buy a single fishing license that would allow us to fish in all the fresh water rivers, dams and lakes that cover this wonderful country. Unfortunately there is not a single licence for fishing all over Spain. Regions have their own rules and it is best to check with the town hall or local Ayuntamiento for the rules governing the licences. Check within the local areas in where you wish to fish, as joining a local fishing club can often provide you with local insight into what freshwater fish are available to catch, and at what time of year. All of the Autonomous regions where fishing is available have their own rules. Fees are payable and in the case of the river Ebro and some other areas, a day ticket is also required. Licences can often be obtained from your local branch of the Caja Bank. You will need to provide your passport, residencia or NIE number and pay a small fee of between 5€ and 15€ to obtain one. If you can find the local fishing club, they will be able to provide you with details and often help you obtain what you need. Big game Fishing in Spain. Most sea fishing, whether from the shore or from a boat requires a fishing licence and can be obtained from companies that register boats or the local Capitan office at the marina, fishing shop or a local fishing club. Any Fishing in the sea from boats also requires a licence. This licence is usually assigned to the boat, so if you sell your boat and it has a licence for fishing, it will be sold with the boat. Individual licences are also available online. On the day, we caught a fabulous 150Kg, approx. 350 Lb Blue fin Tuna. Spear fishing is also a popular sport and this also requires a licence, don´t get caught without one as the fines are not cheap. These are usually issued on the spot. You don’t have to pay them immediately and we would certainly not advise doing so. In the case of the River Ebro, where both a fishing licence and a day ticket is required, it has been known for the local police or fishing inspectors to confiscate your fishing equipment and issue a fine. Fines of over 300€ per person are common. Early payment of the fines can reduce the fine by up to 50%. 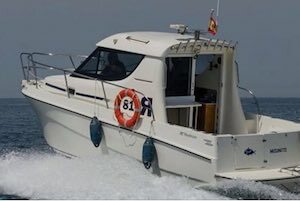 If your boat does not have the correct paperwork or you are unable to produce it when requested, i.e.. when the Guardia or local police arrive, you can also be fined and asked to produce the documents within five days.